Finding Wonderland: The WritingYA Weblog (archive): Stages of Rejection #7: Lather, Rinse, Repeat. Oh, the irony. The horrible, horrible irony. 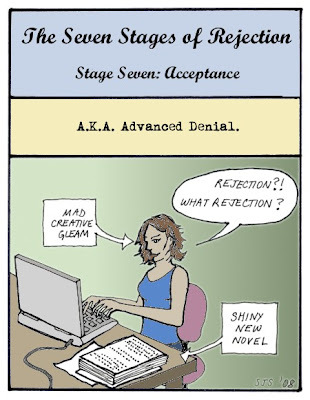 As today's cartoon brings us to the final stage of coping with rejection, and our cartoon writer finally gets on with her writing life, our cartoonist turned on the computer this morning to find...yet another novel rejection! So, since the Seven Stages of Rejection are always out there and waiting, I'll once again become a traveler on that path. Like some horrible writerly version of the Stations of the Cross. Go back to Stage One. Do not pass Go. Do not collect $200 (though, again ironically, I just did collect $200 for a freelance gig--really). And, to add insult to injury, Snoop Dogg is joining the ranks of celebrity children's book authors (via SCBWI's online newsletter). SIGH. To view all the stages of rejection together (but in reverse order, so you'll have to start from the bottom up), click here. Don't worry about that new rejection. Rely on your mad creative gleam. You are cooler that Snoop! Y'know, the Snoop Dog thing -- reminded me that Will Smith has also written a children's book. Granted, it was based on a song he wrote, and we at least know that rappers -- write their own material. Mostly. We assume Snoop does. The thing that disturbs me is the idea of rhyme... Rap has a lot of forced rhyme, and in a children's book -- oy, painful. The Halliwell thing bothers me MUCH MORE. The Spice Girls did NOT write their own music, did they? I mean, seriously -- ?! Love your toons! Linked from my bit of a website (which is in Dutch) to it. The stages of rejection are great!